I had so much fun on Sunday! I was at the Mini Maker Faire with EBHQ , teaching kids and adults how to make “nine-patches”. All of the nine-patches will be made into quilts that will be donated to people who lost their homes in the fires up in Santa Rosa. Most of the young folks I taught not only had never used a sewing machine before, they had never used an iron either. I don’t have any photos of our quilts but I do have photos of other parts of the fair. 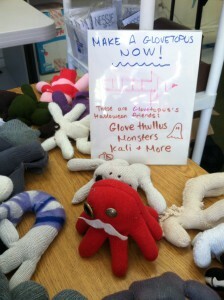 Here are some creatures made from gloves, called Glovetopus. This entry was posted in Classes, EBHQ and tagged EBHQ, mini maker faire. Bookmark the permalink.